Gratitude Gourmet - Chocolate Box Success! Thank you! Thank you for your Gratitude Gourmet Chocolate Mystery Box Monthly Subscription Order! 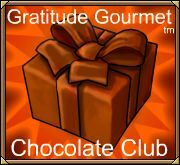 We will be shipping your Gratitude Gourmet Chocolate Mystery Box once a month. Have comments or suggestions, please contact us here. Please note: You will receive an email and credit card billing with the name: 'Green Star Solution'. Gratitude Gourmet (tm) features sustainable eating and drinking, and we’re on a mission to find the most exciting places, new experiences, emerging trends and sensations. Like us on Facebook and follow us on Twitter. We're on Linkedin too!